If there's not a Rapture, friends, where are we at? What are we going to do? What age are we living in? What promise do we have? There is going to be a Rapture. The Bible says there will be. And it’ll be only for the elected, the Elected Lady, the Bride in this day, that’s pulled out, the Church. If a man would try to predict that a certain thing would happen at a certain time and a certain place, it would be about one chance out of _____. To the Church, the Bride, the Rapture is a _____ to Her. On the citrus tree, each grafted branch bears its own fruit. But all of them live off of the same life of the tree. Martin Luther protested the Catholic church. That wasn’t so hard to believe, but the strange thing was that he could _____. We’re living in the seventh church age. Enoch was the seventh, translated. What was Noah a type of? The word Rapture appears in the Bible how many times? In the sight of God, the Bride is justified. What does justified mean? Brother Branham saw a preview of the Bride in a vision. After all the worldly churches, the Bride passed by. Two or three of them were getting out of line. What did Brother Branham scream? At the end of the Message, Brother Branham has the audience shake hands. What does he tell them to say to one another? I love the Lord, do you? 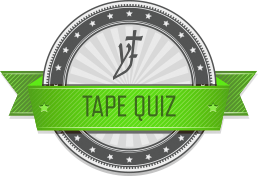 Here are the current quiz results for The Rapture. Anyone taking the quiz after Thursday, December 31, 2015 will not have their score posted.